Our last two blog posts introduced first-person learning as an approach to access our being. Much of leadership development, however, is predicated on knowing more rather than being more. Accessing our being requires discovery from questioning the unknown, and that requires vulnerability (The Power of Not Knowing). Embracing our vulnerability will challenge our sense of self. We tend to resist such a challenge with all of our being, the very being we must now examine. Humans resist change. Given the choice of staying put and being ineffective, or of changing and succeeding, most will choose familiar ineptness over unknown change everyday of the week and twice on Tuesdays. The resistance is cunning, creative and steeped in self-deception. The really smart leverage their extra brain cells to concoct elaborate self-deceptions to justify their fixed and static viewpoints — usually at great costs to their teams and organizations. The Arbinger Institute and its classic book, Leadership and Self-Deception, offers a fable, seen in this video clip, that illustrates how these self-deceptions trap us. First-person learning provides access to this undistinguished being, to discover and distinguish who we are as learners, and to unlearn outmoded approaches that no longer serve us. In time, and with practice, challenging our internal landscape and closely held beliefs can get us “out of the box” (as Arbinger terms it) increasing our capacity to listen, learn and lead. Questioning and confronting our internal landscape loosens the grip our fixed frames of reference or mindsets have on us. This encourages us to shift from what Stanford University researcher, Carol Dweck refers to as a fixed mindset. In her book, Mindset: The New Psychology of Success Dweck reveals how praising intelligence and ability doesn’t foster the self-esteem that leads to accomplishment, but may actually jeopardize success. Dweck’s researched much of her findings in elementary and high school children. She found that some children loved a challenge and wanted to grow. Other children, those encouraged and rewarded for knowing or having to know, were terrified at the prospect of being challenged – for fear that they might not know. She found that this bunch would cheat, lie and give up just to preserve that identity. Let’s fast-forward two decades in that child’s adult life, after receiving many accolades for being smart and knowing. Now these professionals are promoted to leadership roles and discover they cannot know everything, and that expanding leadership comes for not knowing. Are you crazy?!? For many of these emerging leaders, they’d rather die. In fact for many of them this is what Jack Mezriow termed a disorienting dilemma, such an identity crises that it assaults who they know and expect themselves to be. This short video clip explores some challenges. When our identity is so wrapped up in knowing, we defend ourselves against any unknown idea. When we experience uncertainty, we may feel confronted, or even attacked. We challenge any question, control all situations, and fear the unknown. We only engage ideas that we know something about, and we will not invite discussion or dialogue with anyone that may even possibly threaten that identity. Such rigid self-perception is part of what Dweck details, appropriately, as a fixed mindset. Her work builds an arc that helps us travel to what she terms a growth mindset. Shifting to a growth mindset is not easy; it takes time and requires letting go of concealed beliefs, assumptions and expectations about life, success, and leadership. When accomplished, it finds us in the same world but with a new pair of eyes: we no longer view knowledge as an indicator of self-worth, or relate to knowing as the source of our power. We are no longer threatened by not knowing, we are no longer threatened by uncomfortable questions, new situations, erratic change or unpredictable circumstances – scenarios that have now become commonplace. Growth is no longer strategic; it is now a lifestyle. We want to learn, to expand, and can see the wisdom of embracing the diverse and unexpected over the familiar and safe. We place ourselves into the gap, and then figure out who we are in the process. We are alive. I find the pink and green graphic (fixed vs open mindset individuals) and reactions/functional relationship most important. A lot of information to study just in that chart ..
One can get mired in a lifestyle over a short period of years so much that when a new opportunity presents itself there is not enough time to react . Perhaps paring life habits and material inventory is one of the best first tasks one should complete when anticipating or desiring a new course of direction. Upward moves in life presenting new unknowns and challenges are certainly harder than lateral ones – within familiar territories (I believe). And specifically what hazards lie in there .. And how can they be avoided or overcome. I think that’s what people want to know ! I can’t help but be reminded of the importance of culture for someone wishing to move from a fixed to growth mindset. If your piers wish to maintain fixed mindsets, it will be an uphill and very unlikely unpleasant endeavor to make a shift to a more open and vulnerable growth mindset. I am guessing that there is a process and smart way of going about this transition so as to shift the conversation and language that inhabits a growth mindset. … And to do this in a way that creates positive tension in your life. Great observation. 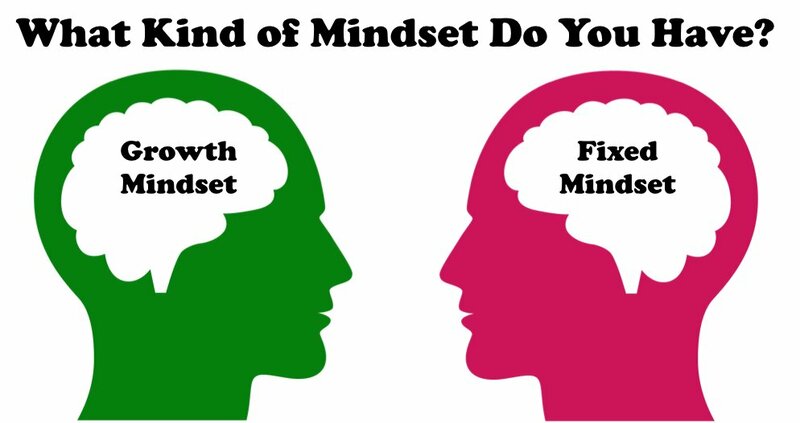 Interestingly and counterintuitively, a growth mindset might be encouraged by the “fixed mindset” culture you describe. In a culture defined by a fixed mindset, such a growth mindset leader would view it as a challenge to approach new avenues of learning. Instead of a threat, they would see an opportunity for individual improvement. 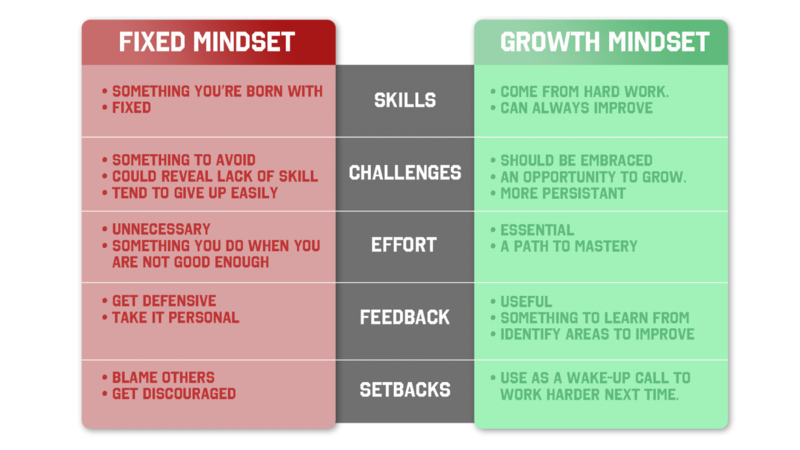 Growth mindsets will continue to learn and grow even in the face of fixed mindsets, as growth mindsets tend to be internally driven, and are marked by persistence. These people may irritate fixed mindsets even more than the other way around. Typically, cultures are a combination of different mindsets and the leader chooses what’s rewarded. But the journey from fixed to growth is a choice that begins with individual self-awareness, in spite of culture.